While you enjoyed the wearing of the green for St. Patrick’s Day, did you stop to wonder why so few birds wear green plumage? Based on how naturally parrots and leafbirds (the real ones in Asia, not the figments that plague birders in every country) blend into foliage, I’d imagine that most arboreal avian species would want the same advantages. Does anyone know why we don’t have more truly green birds? Of course, a green bird wouldn’t fare well in these parts, where the trees are still leafless and rimed with frost. In spite of the resurgent winter weather, our birds of spring have arrived. The first Turkey Vulture of the year is definitely the best one! Corey enjoyed a spring like outing on Sunday morning, adding eight species to his Queens year list. 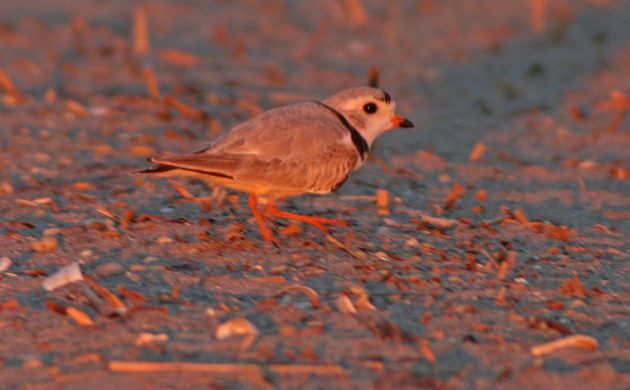 Of them all, his favorite was the pair of Piping Plovers he found at dawn on Rockaway Beach. Either of the two is easily his Best Bird of the Weekend. How about the female or immature male painted bunting as a green bird? They are a common bird here from late March to early October. I don’t think they get up your way though. Noticed some Northern Flickers in the spit of trees across from our Philadelphia house … hope they stay through the summer! Tough call, but will have to go with the Common Black-hawks that are now migrating thru Arizona, over the F.O.Y. Yellow Warbler that I found in Sam Lena Park!